There are a few approaches to making a winning track car. Some automakers shed every possible ounce of excess weight, others go crazy with aerodynamics to layer on the downforce, and almost all pair the stickiest possible set of tires with their production-bound performance machine. 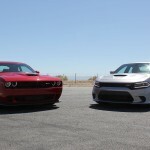 Dodge’s Street & Racing Technology (SRT) division did none of those things when it engineered the 2015 Dodge Charger and 2015 Dodge Challenger SRT Hellcat models. 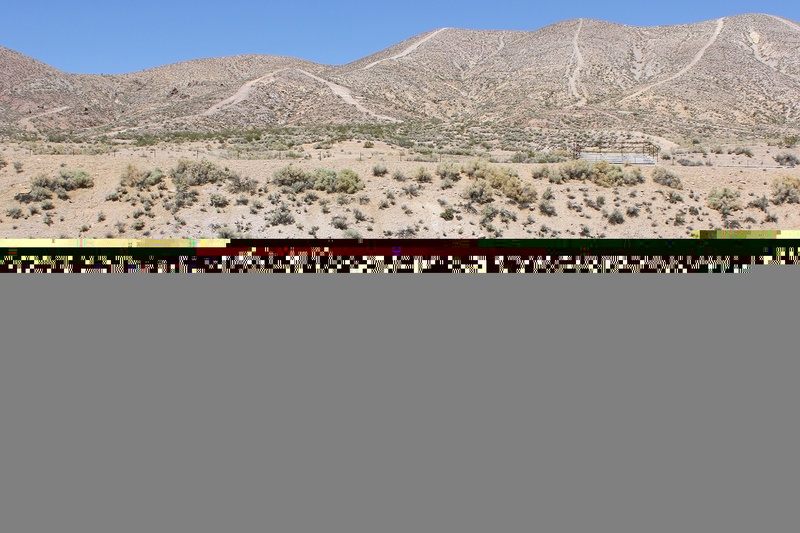 And yet, on a high-speed track like Willow Springs Raceway, both vehicles absolutely inhale the smoothly-paved curves and straightaways with remarkable agility. How did SRT accomplish such a feat? It boils down to a few key ingredients: a monumental powertrain, vice-gripping Brembo brakes, and some tried-and-true suspension tuning. 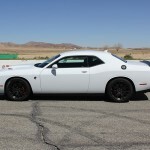 There was an additional component that helped SRT get the Hellcats across the goal line in their current forms: autonomy within one of the largest automotive groups in the industry. 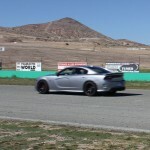 I was fortunate enough to spend an entire day putting the 2015 Dodge Charger and Challenger SRT Hellcats to the test on Willow Spring’s “Big Willow” track as well as picking the brains of SRT’s leading engineers and project managers. In the process of chatting with SRT’s on-site decision-makers, I learned that the in-house tuning division has an extraordinarily unique capacity within the world of corporately-condoned projects: the ability to push a vision for a performance model to production reality without having to appease endless communities of feedback. SRT is one of the many brands within Fiat Chrysler Automobiles (FCA)’s fold, yet as I understand it, the team of performance-minded individuals are so well respected that they’ve earned distinct privileges for vehicle development. 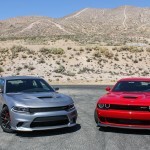 In the case of the Hellcat twins, SRT’s vision for the sinister concoctions of a 6.2-liter supercharged HEMI V8 in larger-than-life bodies with other top-notch performance hardware may have ruffled some feathers within FCA, but the team was still able to put the pieces together without yielding to criticism. The results are two entirely inimitable products that make no excuses for their DNA and have earned die-hard fan groups within automotive enthusiast circles. 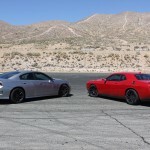 Both the Charger and Challenger SRT Hellcats share of the most powerful engines on the market, developing 707 horsepower and 650 pound-feet of torque, massive Brembo six-piston front and four-piston rear brake calipers clamping down on equally robust 15.4- and 13.8-inch front and rear discs, and ZF eight-speed transmissions. 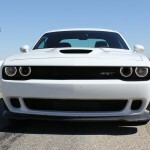 On paper, these elements sound perfect for a quarter-mile monster, but on the track, they prove to be just as capable. 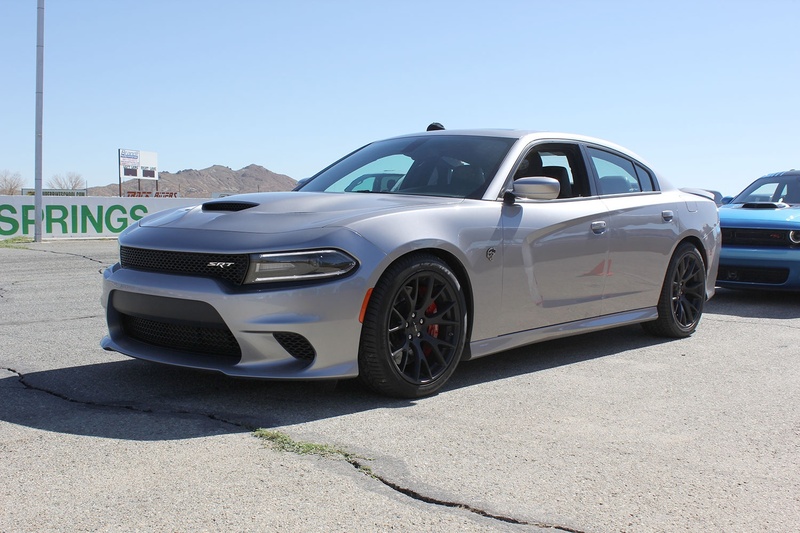 The 2015 Dodge Charger SRT Hellcat weighs 4,575 pounds. Not only does that sound like a lot for any performance model, for a track car, you’d need to be crazy or stupid to turn that heft into a corner-carver. While I can guarantee SRT’s team isn’t stupid, I can’t make the case that they aren’t crazy. 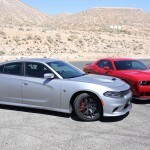 But it would appear that crazy breeds genius, because the Charger Hellcat is not only tremendously capable on track, it’s stupefyingly simple to access the lion’s share of its performance potential. 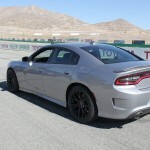 707 hp is nothing to take lightly, but thanks to SRT’s suspension tuning – which includes softer springs and less vicious sway bars than the Challenger, yet equally capable damping – the Charger Hellcat soaks up rapid elevation changes and other obstacles with ease. This setup gives you confidence to push the Hellcat harder in corners and even with the Track driving mode engaged, handling is predictable and oversteer is manageable. On top of its forgiving suspension dynamics, the tenacious Brembo brakes are more than up to the task of scrubbing mammoth amounts of speed before each curve. 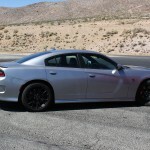 After repeated full-force braking maneuvers, the Charger Hellcat refused to show even the slightly signs of fade, letting me push it deeper into each corner as my confidence behind the wheel built. And of course, when it was time to roll onto the throttle (gingerly), the livid HEMI V8 roared into action, taking me to a top speed of 140 mph on the straight. 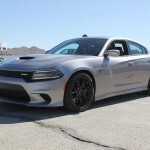 The Charger Hellcat’s steering system received different calibration than the one found in the Challenger Hellcat, and interestingly, I found it to provide greater feedback. 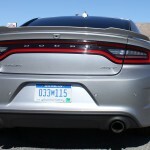 Turn in is slightly less instantaneous compared to its two-door sibling, but the Charger clearly communicates if and when the limits of grip are being approached. The super sedan may be a hefty girl, but its ferocious powerplant and compliant handling hardware helped it rocket around the track in 1 minute 47 seconds (with yours truly at the helm). Though I’ve got a fair bit of track experience under my belt, I wouldn’t be surprised if the Charger Hellcat could dip into the low 1:40’s around Big Willow. That’s a mighty impressive jaunt for a fully-saddled sedan. 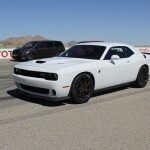 It was directly apparent that the Challenger Hellcat was the more aggressive of the two Hellcats as I took my first laps around Willow Springs. 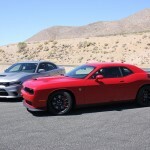 Though it only cuts 126 pounds off the Charger’s beltline, the Challenger feels more tightly sprung than its sibling, which raised its performance limits, but also sharpened its teeth to bite any inattentive operators. 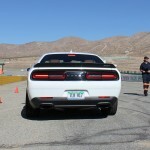 SRT only supplied ZF eight-speed-equipped Hellcats for us to sample, but considering how much man-handling was required to illicit full performance from the Challenger Hellcat, I wasn’t one to complain. Not only did the gearbox free up extra brain capacity to wrestle the Challenger around Big Willow, it clarified what a winning transmission SRT had chosen. I’m a manual-is-always-the-answer type of enthusiast, but the paddle-operated shifts were so rapid and smooth that I’m certain I’d have lost a second or two around the track had I been rowing my own gears. As I mentioned, the Challenger’s steering felt marginally lighter than the Charger, but as momentum builds in the corners, the weight layered on nicely. Steering inputs were immediately applied and combined with a frighteningly willing throttle, the Challenger Hellcat would rotate through turns at a moment’s notice. To manage the back end, smooth power application and measured steering efforts keep the tires churning earth instead of churning air. Like the Charger, I developed ample confidence in the Challenger Hellcat’s braking potential, pushing the two-ton coupe harder with each lap and being rewarded with stable, controlled deceleration. 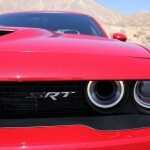 At full-tilt, the Challenger SRT Hellcat managed 141 mph on the straight and lapped Big Willow in 1 minute 44 seconds. Again, in more capable hands, the Challenger would probably drop into the 1:30’s and give both the Chevrolet Camaro Z28 and Ford Mustang GT500 a genuine battle if not a beating. Top-tier lap times are great, but where the 2015 Hellcat twins really shine on the track is their ability to consistently deliver high-speed thrills, whether you’re pointed straight, or sideways. These are neither beginner-level track toys nor precision instruments. SRT never designed them to compete with rival automaker’s track weapons. 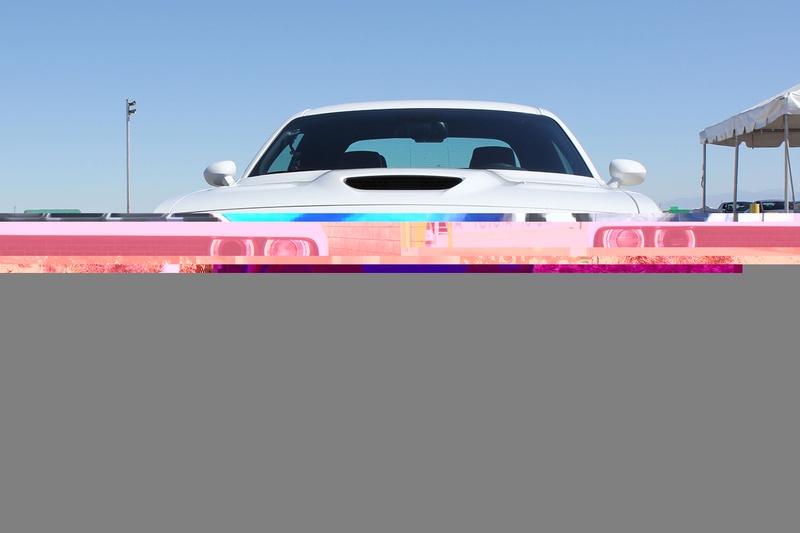 Instead, FCA’s performance division was empowered to create immensely powerful, yet astoundingly capable enthusiast vehicles that are just as comfortable laying down smoky burnouts as they are ripping around a road course. I’m thankful SRT is still allowed to build vehicles that may not make sense to the average consumer, but are a God-send to high-octane addicts.